It has been half a century since the first studies on cell biology. During this time, it was shown that cells consist of a membrane made of lipid-polymer complexes comprising proteins and carbohydrates complexed with lipids. Further studies on cell biology have been based according to this understanding of the structure of the cell membrane. No reports of a cell membrane associated with DNA have been reported. I have been studying the preparation of artificial cells and have demonstrated the formation of cells (named DNA crown cells) containing a membrane comprising lipid-DNA. I have prepared DNA crown cells using a known lipid (monolaurin) in vitro and examined whether these cells self-replicate in vivo. Here, I discuss these successful procedures. First, aggregates of sphingosine-DNA were prepared by the addition of adenosine-monolaurin to sphingosine-DNA. Next, DNA crown cells were constructed by the addition of monolaurin to the sphingosine-DNA aggregates in vitro. Finally, I demonstrated that these cells can self-replicate upon incubation in egg-white. Artificial cells, including liposomes, nanoparticles, and microcapsules, have been studied since the 1960s and have led to impressive achievements in the generation of artificial cells (Zhang et al, 2008; Lin et al. 2013; Kuruma et al. 2009). However, to date, artificial cells which can replicate autonomously have not been reported. Recent work on artificial cells has focused on cell division or replication (Noireaux et al, 2011). I have developed a method to prepare artificial cells (Inooka, 2012; Inooka, 2016, Ref.5). The artificial cells are prepared by incubating in egg-white artificial cell seeds comprising sphigosine (Sph), DNA, and components that bind Sph-DNA, such as adenosine or uridine (Inooka, 2016; Ref.7). I previously reported (Inooka, 2016, Ref; 8) that Sph- DNA aggregated with adenosine-lipids contained in egg-white to generate DNA crown cells. Here, I attempted to prepare DNA crown cells using a known and commercially available lipid, monolaurin. First, adenosine-lipids were prepared, then DNA crown cells were constructed using the resulting aggregates of Sph-DNA. The procedures for synthesizing DNA crown cells are described below. Sph (Sigma, USA), DNA (Escherichia coli strain B, Sigma, USA), Adenosine (Sigma, USA and Wako, Japan), monolaurin (Tokyo Kasei, Japan), and white Leghorn eggs purchased from a market. Preparation of the compound from by mixing adenosine and monolaurin (A-M) A case to prepare A-M is as follows: 0.4 ml (0.1 M) monolarurin was added to 0.4 ml (0.1M) of adenosine solution. After mixing, 0.15 ml of ethanol was added to the mixture and the precipitate was collected and dried. The A-M precipitate was resolved in 1.0 ml distilled water and used. Effect of compound (A-M) on Sphingosine-DNA To examine the effect of A-M on Sph-DNA, Sph (90μl, 10mM) was added to 40μl/μl of DNA (1.7μg/μl). After heating the mixture, A-M solution (50μl) was added., then one drop of ethidium bromide solution was added to one drop of the Sph-DNA-A-M mixture. Then , a drop was placed on a glass slide and observed using phase contrast microscopy and fluorescence microscopy. To synthesize DNA crown cells, Sph (90μl, 10mM) was added to 40μl of DNA (1.7 μg/g/μl). After heating the mixture, A-M solution (50μl) was added and monolaurin solution (50μl, 0.1M) was added to the Sph-DNA-A-M mixture. After mixing, the cells were observed as described above. Artificial cell generation using a mixture of Sph-DNA-A-M solution and transplantation To generate artificial cells using the Sph-DNA-A-M mixtures, 90μl of Sph (10 mM) was added to 40μl of DNA (1.7μg/μl). After heating, A-M solution (100μl) was added to the Sph-DNA mixture. A hole was drilled in the shell of an edible white Leghorn egg and 0.25~0.5 ml of the mixture was injected into the egg white (albumin). Each egg was then incubated for 7 days at 37℃, and a portion of each egg white was removed. About 1 ml of egg albumin was added to 10 ml of Dulbecco’ Modified Eagles Medium containing 10% bovine serum (DMEM) and cultured for 2 days at 37℃. Aggregates of artificial cells were found at the bottom of the culture medium. A drop of the aggregates was placed on a glass slide and the integrity of the artificial cells was observed using phase contrast microscopy and fluorescence microscopy. The artificial cells were transplanted by inoculating a sample of egg-white (0.5ml) containing the cells into fresh egg-white weekly. Also, 2 ml of egg-white containing cells was incubated in 10 ml of DMEM and incubated at 37℃ for 2 days. Transplantation was carried out until the fifth generation. Effect of A-M on Sphingosine-DNA To prepare adenosine-lipid compound, the lipid used was monolaurin, based on previous experiments (Inooka, 2016, Ref.8). monolaurin solution was added to adenosine solution. After mixing, ethanol was added, the precipitate was collected and dried, then, the A-M precipitate was resolved in distilled water Sph (90μl,10mM) was added to 40 μl of DNA (1.7μg/μl), heated, then the A-M solution (50μl) was added. One drop of the Sph-DNA-A-M mixture was placed on a glass slide and observed using phase contrast and fluorescence microscopy. Aggregates of sphingosine (Sph)-DNA with adenosinemonolaurin (A-M). Sph was added to DNA, then A-M was added to the Sph-DNA mixture. Two types of aggregates formed: mucoid-type, shown in Fig. 1a, and crystal-type, shown in Fig. 1b.Scale bar 50 μm. Typical crystal-type of aggregates was shown in Fig1c. 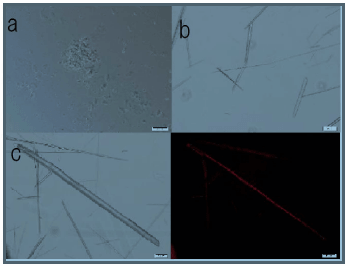 The sample was stained with ethidium bromide and Russert light was observed on the surfaces of the crystal aggregates under fluorescence microscopy (Fig. 1d), suggesting that the surface contains DNA. Scale bar 50 μm. Fig. 1c and Fig. 1d are the same field of view. Construction of DNA crown cells. Sph was added to DNA. After mixing, A-M was added to Sph- DNA mixture, then monolaurin was added to the Sph-DNA-A-M mixture, stained with ethidium bromide, and smeared on a glass slide. The images in a) and b), and in c) and d), are the same field of view. b) Russert light is observed on the surfaces of the particles under fluorescence microscopy, indicating that DNA is present on the surface of the cells. Scale bar 50μm. c) A typical large particle observed using fluorescence microsc py is shown in Fig. 2c. Russet light was observed on the wall of the cell, indicating that the wall contains DNA. Scale bar 20 μm. d) A typical small cell observed using fluorescence microscopy is shown in Fig. 2d. Russet light was observed on the particle, indicating that particles contain DNA. Scale bar is 20μm. Fig. 1b. Typical crystal aggregates are shown in Fig. 1c. Russert light was observed on the edge of the crystal using fluorescence microscopy (Fig. 1d), suggesting that the edge contains DNA. This may be explained as follows: The addition of DNA to Sph results in the formation of fibrous assemblies of Sph-DNA (Inooka, 2000; Inooka, 2014). The assembly may form particulates upon heating. The assembly comprising particles aggregated upon the addition of A-M solution. 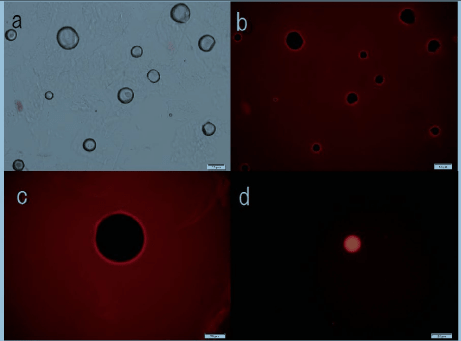 Synthesis of DNA crown cells from aggregates of Sph-DNA-A-M. A solution of monolaurin was added to the Sph-DNA-A-M aggregates and one drop of the mixture was placed on a glass slide and observed using both phase contrast and fluorescence microscopy. Round cells of various sizes were observed, as shown in Fig. 2a. Russert light was observed on the surface of each cell under fluorescence microscopy, as shown in Fig. 2b, indicating that DNA crown cells had formed. A typical large cell as observed using fluorescence microscopy is shown in Fig. 2c and a typical small cell is shown in Fig. 2d. Russert light is clearly observed on the surfaces of both cells. The shrinkage of large cells may result in the formation of cells of various sizes. Artificial fifth generation cells generated using mixtures of Sph-DNA-A-M. The Sph-DNA-A-M mixtures were incubated in egg-white for 7 days, then the egg-white contained artificial cells were transplanted into a new egg. This transplantation was carried out every 7 days for five generations. Fifth generation egg-white (2 ml) was cultivated in Dulbecco’s Modified Eagle’s Medium containing 10% bovine serum for 2 days. Aggregation of the artificial cells was evident at the bottom of the culture tube. Aggregates were stained with ethidium bromide and smeared on a glass slide, then observed using phase contrast and fluorescence microscopy. A phase contrast micrograph is shown in Fig.3a. Three clear cells (arrow) were observed. Russet light was observed on the surfaces of the cells under fluorescence microscopy, showing that the surfaces of the cells were covered with DNA (Fig. 3b). Scale bar 20μm. Fig.3a and Fig.3b are the same field of view. These large and small cells could be formed by the aggregation of crystal-type and mucoid-type cells. The generation of artificial cells from Sph-DNA-A-M mixtures and transplantation of DNA crown cells in vivo. Sph-DNA-A-M mixtures were prepared as described in Step 3. Each mixture was injected into the white (albumin) of individual eggs. After incubation at 370C for 7 days, 0.5 ml of eggwhite potentially containing artificial cells was inoculated into fresh egg-white weekly for five weeks. One week’s incubation is defined as one generation. For each generation, 2 ml of egg-white containing cells was incubated in 10 ml of DMEM and incubated at 370C for 2 days. Aggregates at the bottom of the culture medium were observed. The structural integrity of the artificial cells after 5 generations was assessed by phase contrast microscopy (Fig. 3a) and fluorescence microscopy (Fig. 3b). Three DNA crown cells (arrows) were clearly observed, indicating that DNA crown cells replicated in egg-white. Thus, I have succeed in preparing DNA crown cells using the purified reagents sphingosine, DNA, adenosine and monolaurin. I have also demonstrated (Inooka, 2016; Ref.7) that artificial cells are generated using Sph-DNA and nucleosides, including uridine. Therefore, mixtures prepared with combinations of nucleosides and monolaurin may aggregate Sph-DNA. Moreover, compounds prepared using combinations of nucleosides and lipids related to monolaurin may also form aggregates of Sph-DNA and thus construct DNA crown cells. Here, I used DNA from Escherichia coli. These cells can be prepared using DNA from other sources as well. This means that various DNA crown cells consisting of different components could be prepared by combining nucleosides, lipids and DNA. The current method for preparing DNA crown cells can be performed easily. Cells whose membrane consists of DNAlipid have not previously been reported. This method is readily accessible to anyone and may provide new findings in the life sciences. Zhang Y., Ruder W.C., Leduc P.R., (2008) Artificial cells; Building bioinspired systems using small-scale biology. Trend Biotechnol., 26, 14-20. Liu Y.J. Hansen G.P., Marques A Venancio, Kiyoshi K., (2013). Cell-free preparatiom of functional and triggerable giant proteossomes. Chembiochem. 14, 2243-2247. Noireaux V.,.Maeda Y.T.,.Libehaber A., (2011) Development of an artificial cell from self-organization to computation and selfreproduction. Pro. Natl. Acad. Sci., USA 108, 3473-3480. Inooka, S.,(2016) Preparation of Artificial Cells Using Eggs with Sphingosine-DNA. J. Chem Eng. Process. Technol. 17, 277 http://dx.doi.org/10.4172/2157-7048,1000277. Inooka, S., (2012) Preparation and Cultivation of Artificial Cells. App. Cell Biol. 25, 13-18. 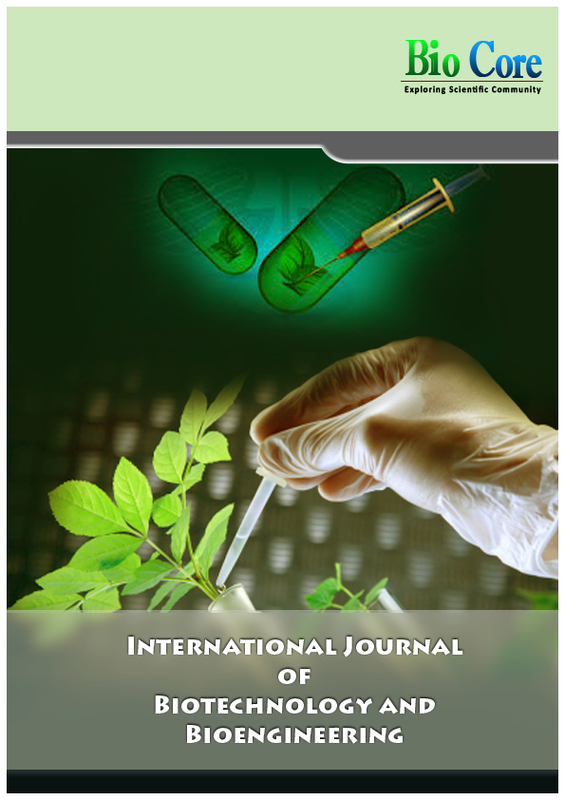 Inooka S.,(2016) Investigation of the chemical composition of artificial cell seeds sphingosine-DNA bound components from extract of the meat fromAdult Ascidians International Journal of Current Research in Life Science 5, 534-540. Inooka S., (2000) Cytoorganisms (cell-originated cultivable particles) with sphingosine-DNA. Comm. Appl. Cell Biol., 17, 11- 34. Inooka S., (2014) Theory of cytoorganisms generation (sequel). The track of the dawn of self-replicating artificial cells (in Japanese). Daigakukyuoiku Press. Okayama, Japan.